A versatile grape variety, Lakemont (White) is able to be grown either outdoors or indoors. 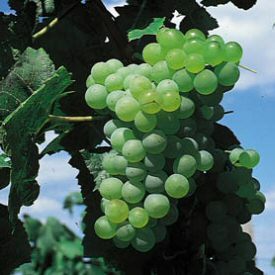 It is a good seedless variety producing large bunches of yellow, oval shapes grapes of excellent quality grapes. These have a distinct muscat flavour. Lakemont is resistant to mildew and downy mildew. First introduced from the United States in 1972, it is now well-established in the UK variety. March 2014: Had anticipated 2-3 weeks before delivery assuming vines currently dormant; it arrived 2 days after ordering and would have been one day sooner had no mix up over postcode occurred (somewhere in the process W13 was mis-typed or misread as W12. Plant has arrived safely and rapidly transferred for growing on in a suitable, larger container. However I cannot yet tell whether it is still dormant or dead! If the latter, I will contact you again in 2 - 3 weeks from now. M. Stratton ....editors note: Definitely dormant. Vines are like teenagers and take a while to wake up!.